Although Hiyori now knows the gods’ terrible secret, her problems are just beginning. Yato’s father is more than displeased with the rebellious refusal to obey his wishes. 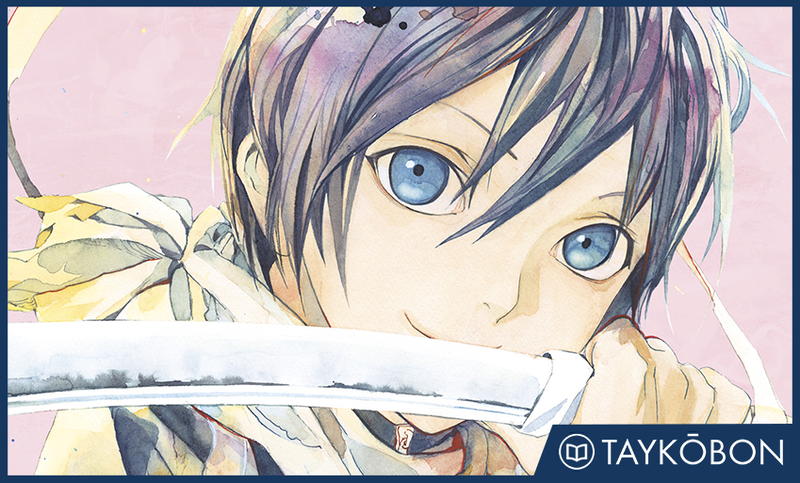 In order to bring Yato back under his control, he takes drastic action in dealing with Hiyori. During the resulting chaos and fighting, the true power of the Stray’s abilities comes to light, and the danger the gods’ shinki face increases exponentially as the gods’ most important secret comes closer and closer to being revealed. As Yato’s father (in the body of Kouto Fujisaki) becomes increasingly aggressive and involved in Yato’s life, the story begins to take another turn for the more serious. Fujisaki, whose wish created Yato in the first place, wants to keep him under his control and blames Hiyori’s involvement for Yato’s insolence. Fujisaki’s increased antagonism puts Hiyori in a nasty situation and dregs up more of Yato’s past in more ways than one. While much of these volumes hint at coming greatness being set up, the books themselves are also incredibly good at doing what Noragami does best. I feel like the greatest strength of Noragami at the moment is really its ability to tie everything together. As Fujisaki has become the clear mastermind behind most of the conflict throughout the series, many important details from various points in the story have been dredged up again. In many other stories, I have felt that the author cleverly planned out developments from the beginning, and that their foresight benefited the story greatly. While Noragami definitely is an example of this, the storytelling is even more interesting because instead of primarily relying on hidden bits contained in the previous portions of the story, it mainly features natural progressions for quite a few characters that continually draw on present events as well as the past for surprisingly organic advancement. Fujisaki is the focal point of this, and many developments caused by him exemplify this storytelling excellently. For Yato, when Fujisaki creates havoc to attempt to control him, it not only forces him to act but also draws on Yato’s past, both from events before and during the actual series. While Yato’s character progresses due to actively occurring events, readers’ understanding of him is increased through new facets of previous ones. As well done as this type of character progression is on a case-by-case basis, what is really incredible is how many characters receive similar treatment without the cast drifting into a collection of underdeveloped plot devices. Even seemingly minor details, such as Kazuma’s feelings of inferiority towards Stray (now mostly referred to as Chiki since she serves as Fujisaki’s weapon), are made extremely relevant and further his character concurrently with his reactions to major events in the story. The relationship between gods and their shinki, an already consistent highlight of the series, continues as the gods’ secret concerning the true nature of the names they grant their weapons. The dramatic irony in the fact that the shinki are unaware of how tenuous their existence is has become exponentially more moving. Yukine, Kazuma, and others all struggle to attempt to help their masters without understanding what is going on or how much danger they themselves are in (especially with Fujisaki involved), and this paves the way for quite a few emotionally charged scenes. The true nature of the shinki binding, that the god takes the original names and karma of their shinki and seals them with a new name, is a very tenuous system. Chiki’s ability “Liberation”, which cracks the given names and causes memories from a shinki’s previous life to resurface, is the ultimate killing weapon for shinki and creates a very substantial threat to the gods’ way of life. This new exploration is surprisingly more dynamic and interesting than ever before, and I really enjoy how author duo Adachitoka are utilizing it in the story. If there was any one character who progressed the most in these two volumes however, if would be Hiyori. Although she is not directly impacted by the gods’ relationships with their shinki, it is her ties to Yato that enrage Fujisaki, and thus she is his primary target. In order to force Yato to obey him, Fujisaki targets Hiyori’s family, namely her parents at the hospital they own. The ensuing chaos after Fujisaki’s meddling is suspenseful, but the pressure it puts on Hiyori and the resulting moment with Yato is moving and definitely one of the best scenes in the series. Hiyori’s conflicting desires to be with Yato and to live out her human life are both excellent character progressions individually and in relation to each other. Additionally, Hiyori’s family is looked upon in a new light as her relatives outside of her parents make appearances in the story. In particular, Hiyori’s brother Masaomi makes for an interesting and welcome addition to the cast. Noragami has always done an excellent job at making me involuntarily hold my breath as I turn each page. The “big picture” for the series seems to have finally pushed its way to the limelight, and the writing capitalizes excellently on all the world building and character development the series has already made. While it’s clear that there is much to come from all of this still, many of the developments in volumes 13 and 14, including Hiyori’s crisis and the terrible truth about the gods’ pacts with their shinki, shined quite well and made for another high point in what is already an excellent series. Noragami Vol. 13 & 14 were translated by Alethea Nibley and Athena Nibley and published by Kodansha Comics USA on April 19th and May 17th, 2016. The series is currently ongoing in Kodansha’s Monthly Shonen Magazine, and had an anime adaption by Bones which aired from January 2014 - March 2014 with a second season that aired in Fall of 2015. The fifteenth volume will be released in English on June 21, 2016.